Although far from including everything from the history of our community, this timeline does include many of the activities and developments that shaped our city into the great place it is today. Items in bold are related to the Crown Point Community Library. 1834 October 31 – Crown Point was settled and founded by Solon Robinson. It was known as Robinson’s Prairie, named after Solon Robinson (labeled as the “Squatter King”). 1834 Fancher family settled on the shores of what would later be named Fancher Lake. 1835 The first school was established by Mrs. Harriet Holton, who taught in her home. 1836 The Crown Point Post Office opened. It was the first in Lake County. 1836 March 14 – Solon Robinson appointed Postmaster by President Andrew Jackson. 1837 February 15 – Lake County was organized without choosing a county seat. 1837 Solon Robinson opened Crown Point’s first general store with his brother Milo Robinson. 1837 March – Solon Robinson elected clerk of Lake County. 1837 October – First courthouse was built with money provided by Solon Robinson. 1837 The first newspaper in the region, called “Great Western” or “Western Ranger,” was published by Solon Robinson, but only sporadically, until 1842. 1838 February – The General Assembly of Indiana enacted the temporary location of the county government and court house at Lake Court House in two-story log structure built by Solon Robinson on the southwest corner of the square. 1839 Liverpool was selected as the county seat, but proved an unpopular choice. 1840 June – The temporary Lake Court House became the permanent county seat, beating out Liverpool and Cedar Lake. The name of the community was changed to Crown Point, the highest point in Lake County. 1841 The Mason and Farrington brickworks opened. 1850 The second courthouse building was constructed. 1852 The first County Fair was held for 1 day at the courthouse. 1852 Solon Robinson left Crown Point to pursue work along the East Coast. His wife Mariah stayed in Crown Point. 1857 The Lake County Herald newspaper was established by John Wheeler, Janna S. Holton, and Zerah F. Summers. 1857 The first lending library was established in Crown Point as the McClure Library Association. 1858 The Crown Point Register newspaper was founded after Wheeler and Summers purchased Holton’s interest. 1863 Timothy Ball established his home in Crown Point. 1865 The Chicago and Great Eastern Railway opened in Crown Point. Crown Point then received its mail by the rails. 1865 The Crown Point Institute School opened at present location of the Crown Point School Corporation Administration Building on North Street. 1868 June 3 – Crown Point was incorporated as a town. 1868 August – First sidewalks were constructed. They were made of wood. 1873 January 31 – The Crown Point Fire Company was established. 1873 Cheshire Hall was built. It was named after W.W. Cheshire who came to CP after the war to become superintendent of the public schools. 1874 The First National Bank of Crown Point was organized. 1876 The land for the Lake County Fairgrounds at Fancher Lake was purchased for $3975.00. 1878 September – First cornerstone was laid for the Court House. 1882 The Letz Manufacturing Company began producing farm equipment. It closed in 1965. 1882 The Lake County Star newspaper was established. 1882 The Sheriff’s Home and Jail began construction. 1885 The Crown Point McClure Library Association closed and transferred its 148 volumes to Public School of Crown Point. 1891 February 13 – Electric arc lights were placed around the square. 1895 First water mains were installed. 1896 First telephone was used by the pumping station at the water works. 1896 October 7 – Democratic Presidential Candidate William Jennings Bryan addressed an audience from the steps of the Courthouse. 1906 May 23 – The 9 member board was formed to establish the Crown Point Library. 1908 February 12 – The O.G. Wheeler property on South Main Street was purchased to become the Carnegie Library at Crown Point. 1907 Two 2.5 story additions were built on the Courthouse. 1909 June 19 – First Cobe Cup Race in Crown Point. The winner of the 25 mile race was Louis Chevrolet. 1911 June 6 – Crown Point officially became a city. 1912 July 31 – The Gary and Southern Traction electric streetcar began operation, traveling between Gary and Crown Point. 1912 August 2 – The Calumet Electric Company (NIPSCO) was established. It was renamed NIPSCO in 1926 after a merger with several companies. 1915 The start of the “Marriage Mill” period. Couples from around the country came to Crown Point for a “quick” marriage performed by Justices of the Peace since there was no blood test or three-day waiting period requirement. This ended in 1940 when Indiana changed its laws. Although still a popular destination, the numbers did decrease and the heyday of “The Mill” was over. 1928 Two 1.5 story additions were built on the Courthouse. 1929 The Crown Point Police Department was founded. 1935 October 1 – Groundbreaking of the Crown Point Post Office at East and Joliet Streets. 1946 The Crown Point Airport opened north of downtown. It closed in 1970. The Fountain Ridge Subdivision is currently at the location. 1969 Hub Swimming Pool opened. It was the only community pool in the Midwest built with private funds and a land donation from the Sauerman family and no tax dollars. 1971 New construction to the Library, including an addition, began at 214 South Court Street. 1973 The Crown Point Library reopened after the renovations with its entrance now on Court Street. 1973 May 17 – The Old Lake County Courthouse was placed on the National Register of Historic Places. 1974 The Lake County government offices moved into the new Lake County Government Center. 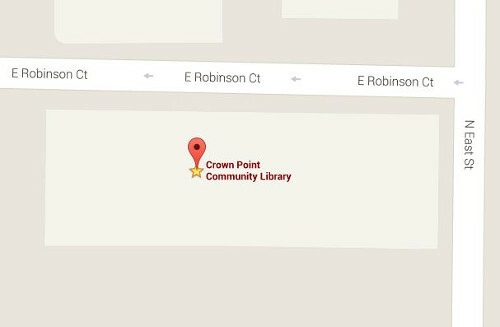 1982 The Crown Point Library was renamed as the Crown Point Community Library to include Winfield Township as part of its service area. 1984 The Sesquicentennial Celebration of Crown Point. 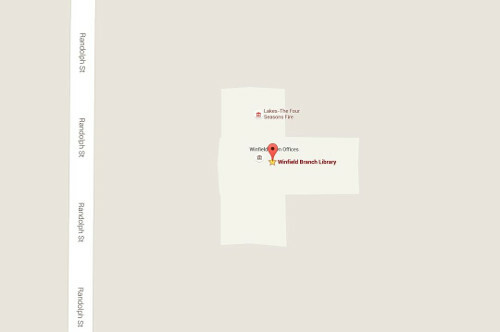 1989 The Winfield Branch of the Crown Point Community Library opened. 1993 October 30 – Although he died in Florida in 1880, Solon Robinson’s remains were brought back to Crown Point and dedicated for burial in Maplewood Memorial Cemetery. 1995 Renovations updated the Crown Point Community Library to include a children’s section, teen area, and research area, as well as installing new carpet and décor. 2002 The Lake County Fair celebrates its 150th Anniversary. 2004 The Courthouse Square District is placed on the National Register of Historic Places. 2009 The 175th Anniversary of the founding of Crown Point. 2012 October 22 – The new Crown Point Community Library opened on North Main Street. 2016 The new Winfield Library Branch opens. 2016 Indiana Bicentennial. Statehood day is December 11th. 2018 The “Grand Old Lady” or the Lake County Courthouse turns 140. 2018 The Crown Point Community Library celebrates 110 years of serving the community.